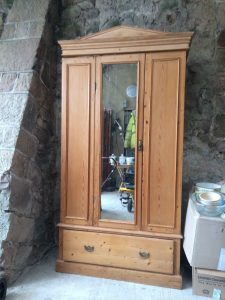 House Clearance Service In Milngavie East Dunbartonshire Alexandria Arrochar Auchinstarry Balloch Bearsden Bonhill Bowling. I came across your website while I was looking for assistance in clearing some articles from my fathers house. I live in Australia but will be in Milngavie in May. My father is in a residential home and my plan is to empty the majority of large furniture from his house and put the house up for sale during the week I’m in Milngavie. Is this something you could help with? It’s mainly some lounge/dining/bedroom furniture. I will be disposing of the smaller items by skip hire. There may also be some items in the garage that will need to be disposed of as well. If this is a possibility could you please contact me with the level of service you can provide along with an estimate for the house clearance?. 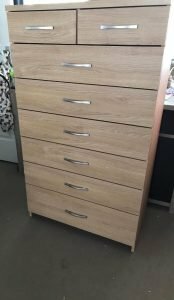 A tall beech wood chest of drawers, having two small over six large drawers, each with chrome handles. 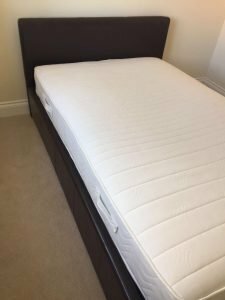 A black faux leather upholstered double bed frame, together with a white silent night double mattress. 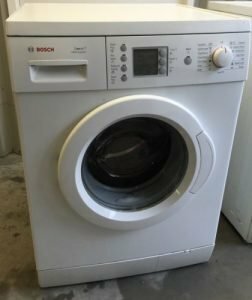 A white Bosch Excel 7kg under counter washing machine. 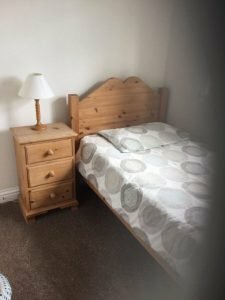 A solid pine single bed frame and single mattress, together with a matching bedside chest of drawers. 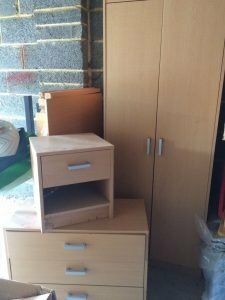 A three piece light wood wardrobe suite, comprising a double wardrobe, a chest of drawers and a bedside unit. 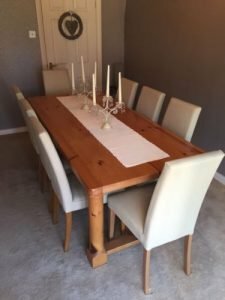 A large farmhouse style solid oak dining table, together with eight matching high back dining chairs, upholstered in white faux leather. A tall antique style solid wood mirror inlaid triple wardrobe, having one large brass handled drawer to the bottom. 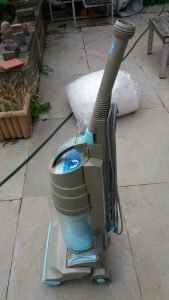 A grey and blue Dyson DC01 upright vacuum cleaner. 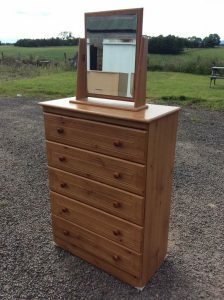 A tall solid pine chest of drawers and matching swing mirror, having five large drawers with circular knobs. 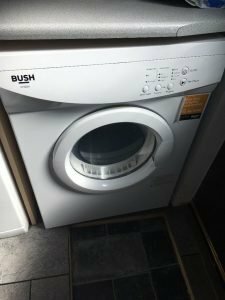 A white Bush 6kg under counter vented tumble dryer. 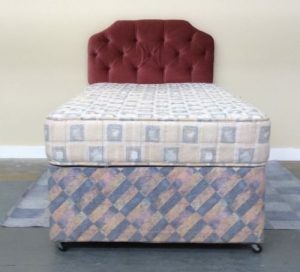 A single divan bed base and mattress on castors, together with a removable single velvet upholstered buttoned headboard. 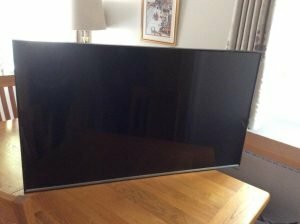 A black Samsung 55 inch flat screen LED smart television. 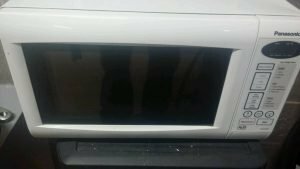 A white and black Panasonic 20L microwave oven. 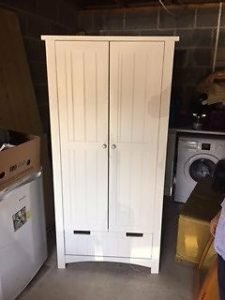 A painted white solid wood double wardrobe, having one large drawer to the bottom. 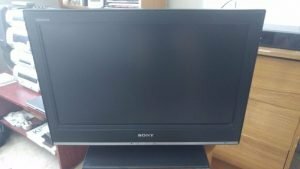 A black Sony Bravia LCD HD 26 inch flat screen television. 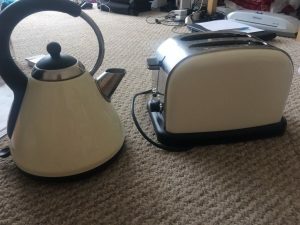 A cream and black Delonghi cone shaped kettle, together with the matching two slice toaster.